Right now the piece I'm saving for is a coffee table...it doesn't have to be new...just something I love. For now my Craigslist $30 table will do, but I can't help enjoying this beautiful piece from the most recent DWR catalog. In case you were unaware, DWR is hosting a sale in a few weeks (see that big red circle in the upper right corner?!). 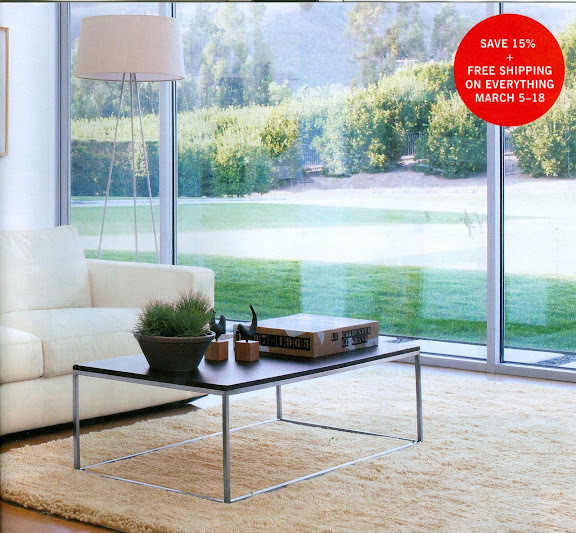 I'm not sure I've seen a sale this good from DWR in a long while. The way I see it, it's better to have a room full of second-hand but good-looking furniture + one fabulous iconic piece, than to have a room full of all mediocre, chain-store furniture. Plus, it's more fun to use and love on a daily basis.